Despite many articles related to Android on SitePoint, it’s been a while since we had a real ‘beginners’ tutorials. How better to fill that gap than with a staple of beginners tutorials, the ‘To Do’ App. Android Studio, the official Android IDE (integrated development environment ). There may be still developers using the old ADT plugin for Eclipse, but that’s not maintained anymore. IntelliJ IDEA also supports Android development, so you may use that too. The Android SDK is the toolchain that manages everything required to build an Android app. It ships with Android Studio, but if you decide to use another IDE, you’ll have to download it. It’s useful to have an Android device so you can test the app during development. If you can’t get your hands on an Android device, you can use the default emulator or Genymotion. Note: Android’s biggest positive and flaw is it’s flexibility. I will use a particular IDE and SDK version, if your setup is different, then settings, code and screenshots may also vary. You will need basic Java knowledge to follow this tutorial. You can find the final code for this project on GitHub. 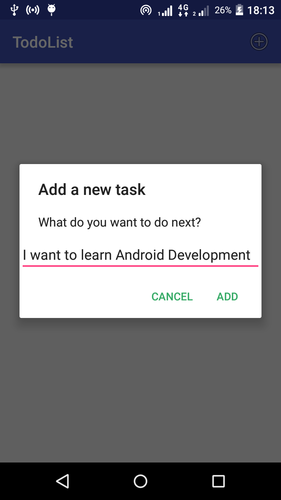 To create a new project, open Android Studio and click Start a new Android Studio project. Name the application “TodoList”, and add your company domain, which will be the application package. 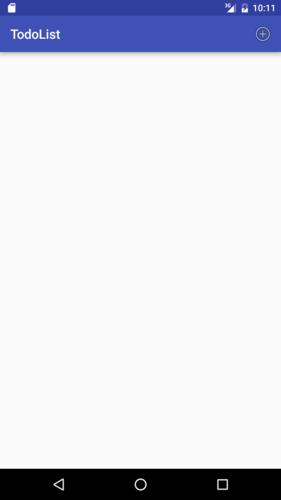 There can’t be two apps on the Play Store with the same package name or called “com.example”. I will name mine com.aziflaj.todolist. Next, pick the platforms you want to develop for. I recommend setting the minimum SDK to support API level 15 and above. This means the application will support every smartphone with Android 4.0.3 or later. On the next screen select Empty Activity and keep the name as MainActivity. When Android Studio finishes generating the project you have the default “Hello, World” app. Now you will define a list item, which will represent a task in the interface. Create a new layout file in the /res/layout folder called item_todo.xml. You will add two elements to this file, a TextView to show the task, and a “Done” Button to delete the task. Add this code to item_todo.xml, replacing anything that is already there. Add this code to TaskContract.java, changing the two package names appropriately. Note: If the two last commands don’t work for you, the SQLite3 utility is not included in most production devices, but you can install it by yourself. Now you need to fetch all the data from the database and show it in the main view. When you run the application, LogCat will show a list of all the tasks stored in the database. Next you will display data in the main view using an Adapter. This ArrayAdapter will help populate the ListView with the data. If the adapter is already created (which implies that it’s assigned to the ListView), clear it, re-populate it and notify the view that the data has changed. This means that the view will repaint on the screen with the new data. After finishing a task, it should be deleted from the list. Now, clicking the Done button will delete the task from the list and the SQLite database. 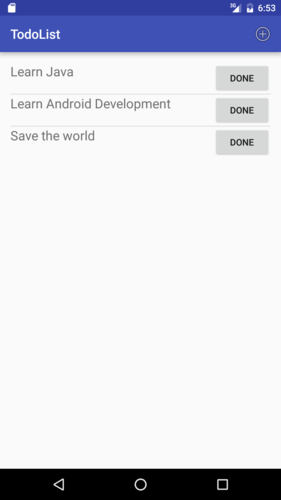 After writing all this code, you have a simple TodoList application, built with Java for Android. If this tutorial has got you interested in learning more, then your next step is looking through the rest of SitePoint’s Android content. Enjoy!